My stash tally has proven to be very useful. A quick glance at it before hitting "place order" on a cart full of goodies often is enough to pare down my purchase, or cancel it altogether. It's also handy when I am thinking about a potential project and whether I have anything suitable on hand. And most useful, I have found that tracking my purchases (and deleting them from the list after they have been used) has allowed me to see what I use quickly and what tends to collect dust in the stash tubs. What I have found is that cotton knits (especially those with lycra content) don't last long at all in the stash. I guess I like sewing knits even more than I thought I did. Wovens, however, linger on and on when I am not doing much sewing for myself. I have a number of larger shirting cuts that are earmarked for projects for myself, and once I drop a few more pounds, I hope to use those for some new Lisette Traveler shirts and tunics. 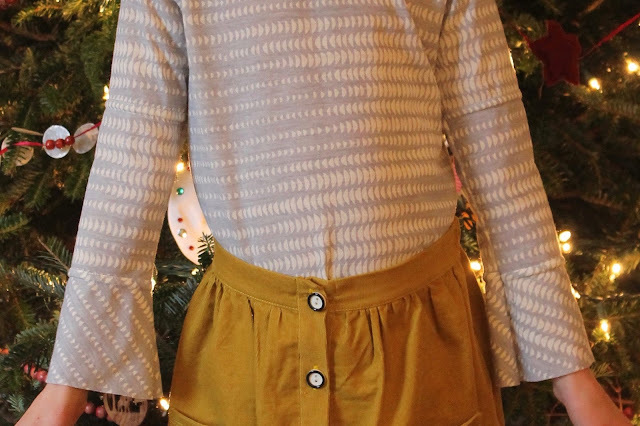 When I'm not sewing for myself, I tend to sew wovens for the kids mostly during the warmer months. Basically I should not buy any more woven fabrics, but I can pretty much always justify purchases of knits. I was very happy earlier this week to have a stash. Natasha is in her ballet school's performance of the Nutcracker this week (dress rehearsal is tonight!) 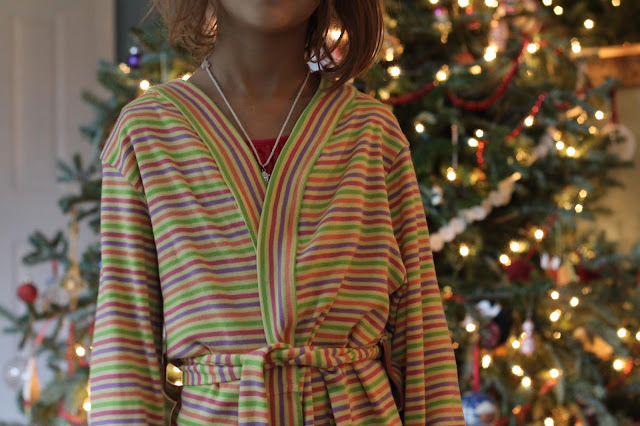 and she needed a robe to wear backstage. I hit up some brick and mortar retailers looking for one, but there were no little girls' robes to be found. Everything online was more than I wanted to spend, so finally I gave up and decided to sew one. I used the free Sleepy Robe pattern from Melly Sews, and found a yard of this drapey cotton rib knit in my stash. I didn't love this fabric at the time of purchase - and I would not have bought the fabric if it had not been 100% cotton and only $2.97 a yard - but now I am glad I did because nothing else I had stashed away would have worked as well. The pattern comes in four sizes. I sewed the 5/6, which as you can see, is really roomy. Natasha is skinny but I would say that the 5/6 fits more like a 7/8 - the sleeves are much too long too. But it was a quick and satisfying sew. And it's cozy and will do the job, and should fit for another two years, so that's something. The girls asked for American Girl dolls for Christmas this year. 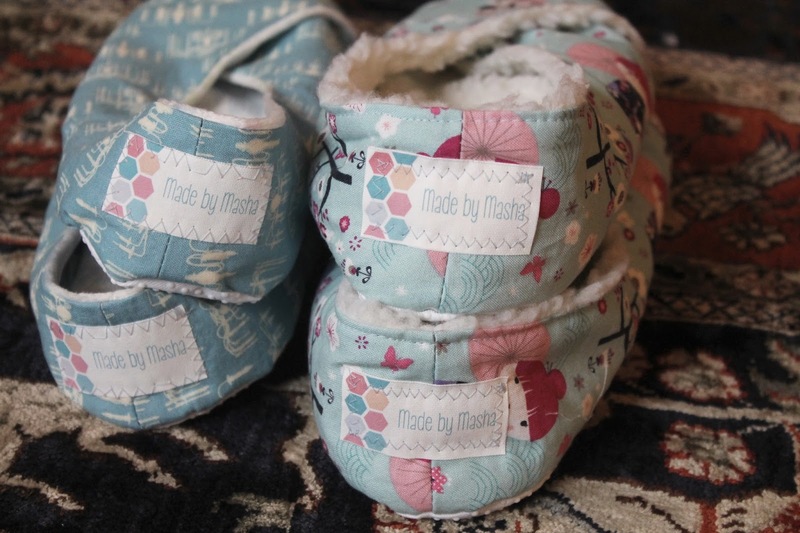 I decided to walk in my Babushka's shoes and make some clothes for them. 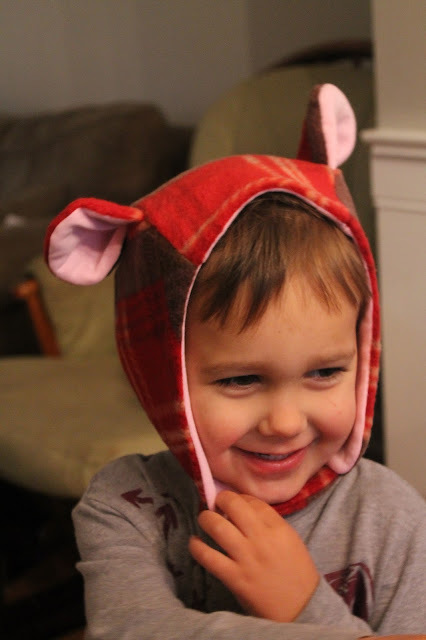 I found a number of free patterns online and set to work. These clothes were made over a period of about six weeks. 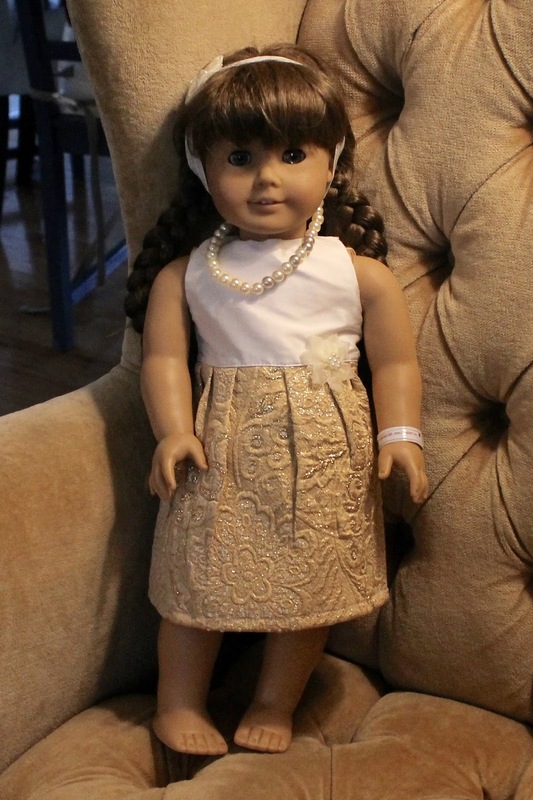 The dresses were sewn using an original American Girl doll pattern - the one for Molly's jumper. 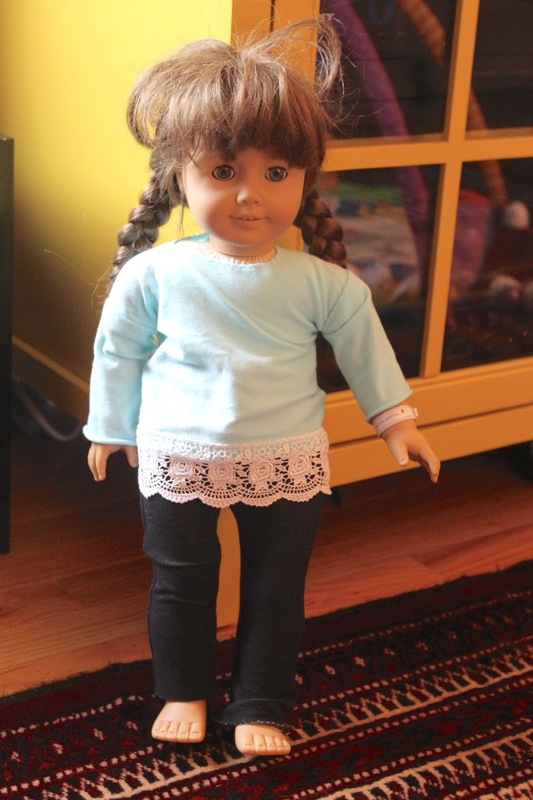 As it happens, Molly is the doll I owned as a kid. I still have her hanging around, which was handy when I needed to try things on her. I raised the neckline on the bodice pattern and then played around with the skirt pieces for each dress. This one was sewn using a scrap of brocade from my Babushka's seamstress days. I remember my mom telling me that the brocade was left over from a wealthy client's custom gown. The scrap has been sitting in my stash since I began sewing, and this seemed like the perfect use. I did some hand-beading on the bodice. It is a really relaxing way to spend an evening in front of the TV. Here's another dress using the same gold brocade. I used a scrap of white silk dupioni for the bodice. It is adorned with a pre made flower. The headband is cream-colored fold over elastic and has the same flower trim on it. I made the necklace too. Sunlight has been hard to come by around here lately, sorry for the picture quality. This one is some synthetic dupioni in a muted green color with a tulle overlay. Store-bought fabric and bead flowers for the trim and the headband. Slightly better photo of the green dress. I also made a few casual looks. 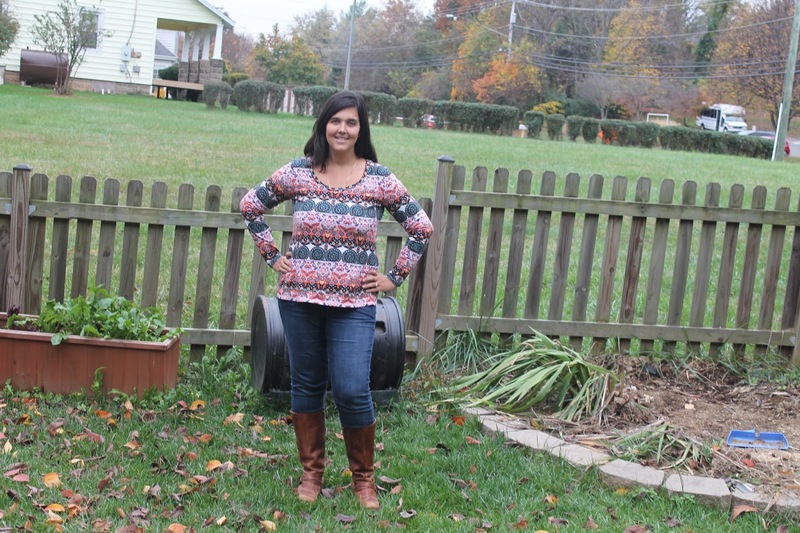 The jeggings were made using this pattern. I made one pair for each girl, but I reversed the fabric for the second pair so they wouldn't be the same. 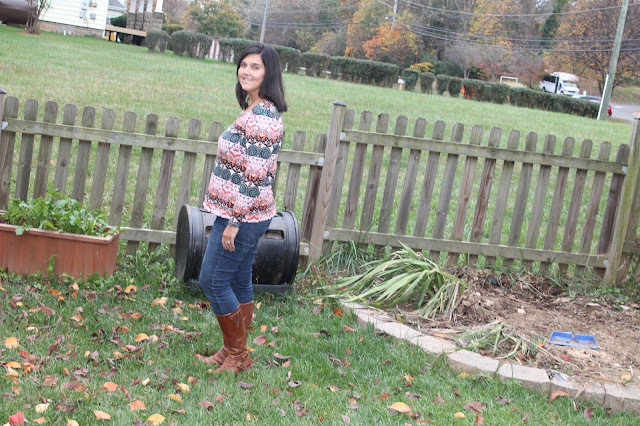 The short sleeved tees were made using the Liberty Jane trendy tee pattern. 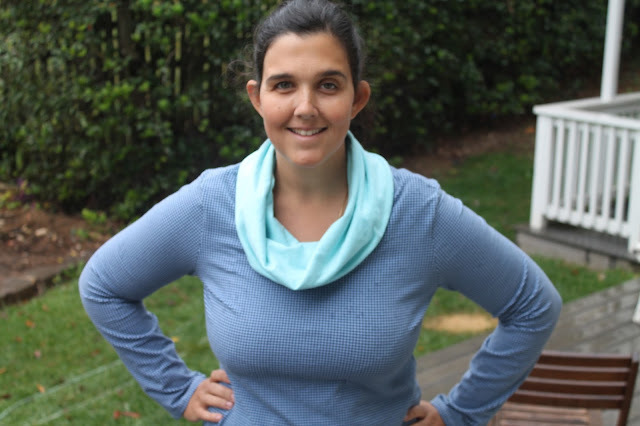 I modified it to make it a kimono sleeve pattern a la my beloved Kirsten Kimono shirt, to make it a faster sew. 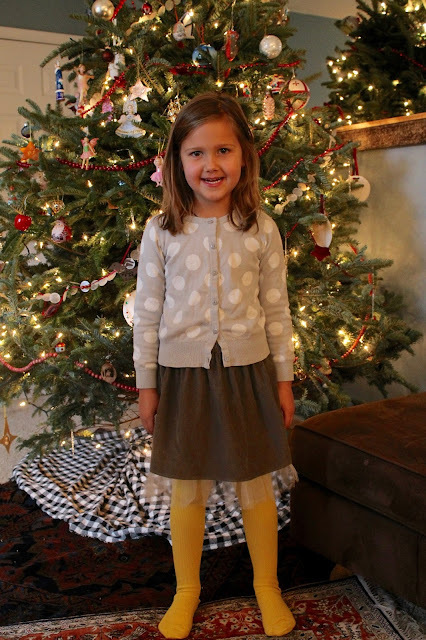 This cute peplum skirt (using scraps from the Arielle skirt I made my sister this summer) was made using this pattern. 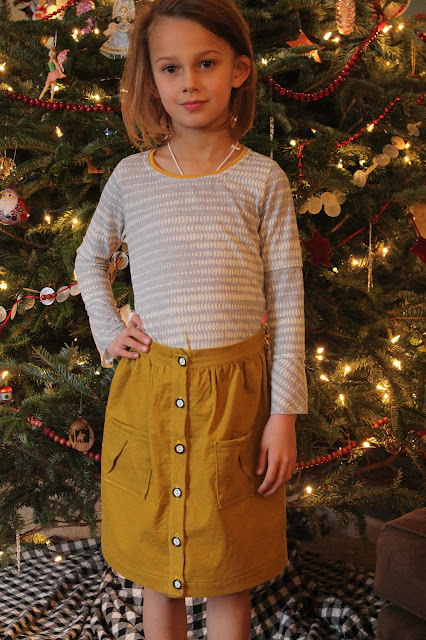 I also made this adorable bubble skirt (pattern here) and another kimono tee. 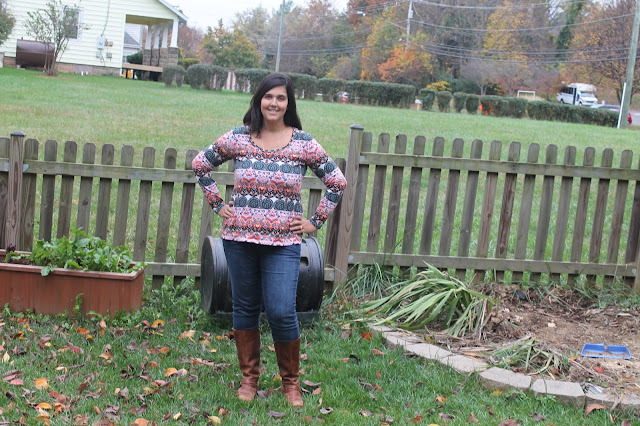 I made the long-sleeved shirts using this tutorial. 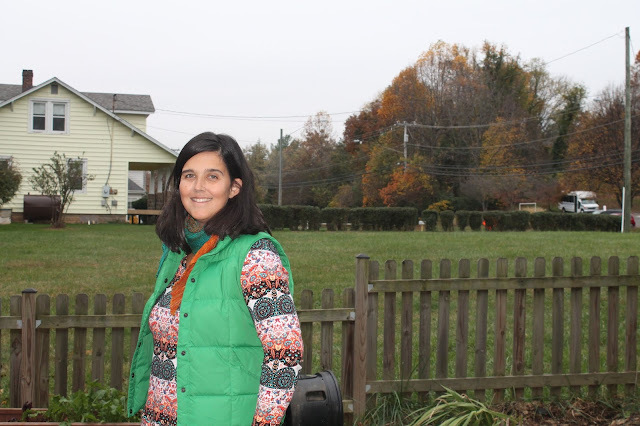 This skirt was just a rectangle of fabric gathered into an FOE waistband. I also made two pairs of white tights from women's knee socks, using this tutorial. I was really surprised at how much fun I had sewing these clothes. The idea of sewing doll things was never appealing to me - I always thought I'd rather spend that time sewing for myself. But sewing for my postpartum shape has been frustrating, and dolls are pretty easy to fit, so there's that. 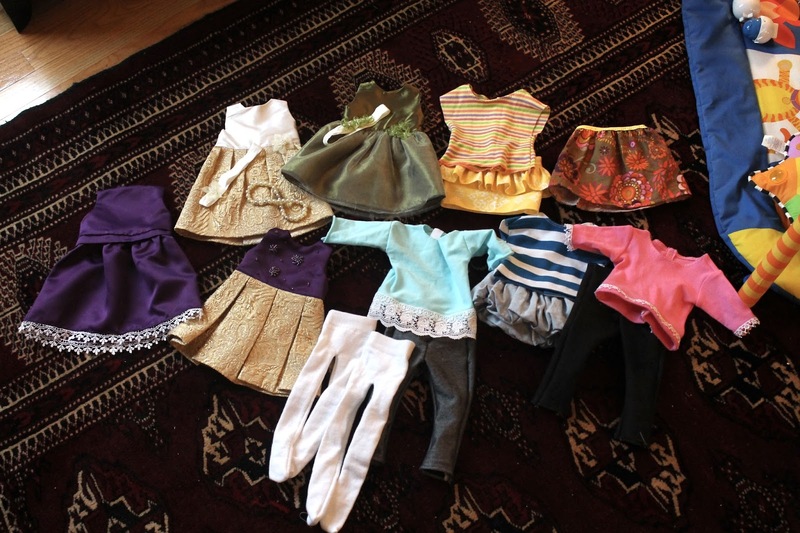 I'm sure there are more doll clothes in my future (and hopefully more selfish sewing, too). I don't know how it happened, but somehow, the year that I had the least amount of time to sew ended up being the year that I made the most handmade gifts. 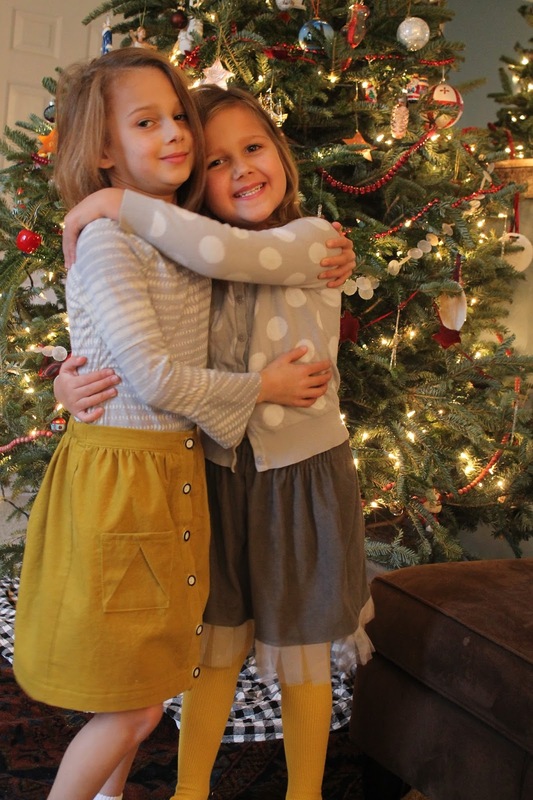 I think that probably has a lot to do with our incredible fairy godmother, who continues to send packages stuffed with gorgeous handmade clothes for my kids. This has freed up my limited sewing time for other pursuits. 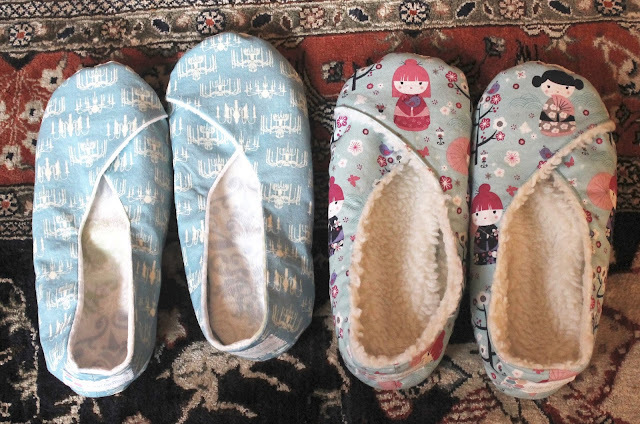 I decided to make slippers for my sisters, who always wear them around the house. I started out looking for some free tutorials, and sewed up a whole slipper using one of them until I realized that the sizing was way off. In the end, I bought this pattern. The sizing seems pretty on, but the instructions are kind of hard to decipher - I am guessing that the designer is not a native English speaker. The construction is pretty easy once you figure it out, though. And for less than $4 on sale, I got a usable pattern. 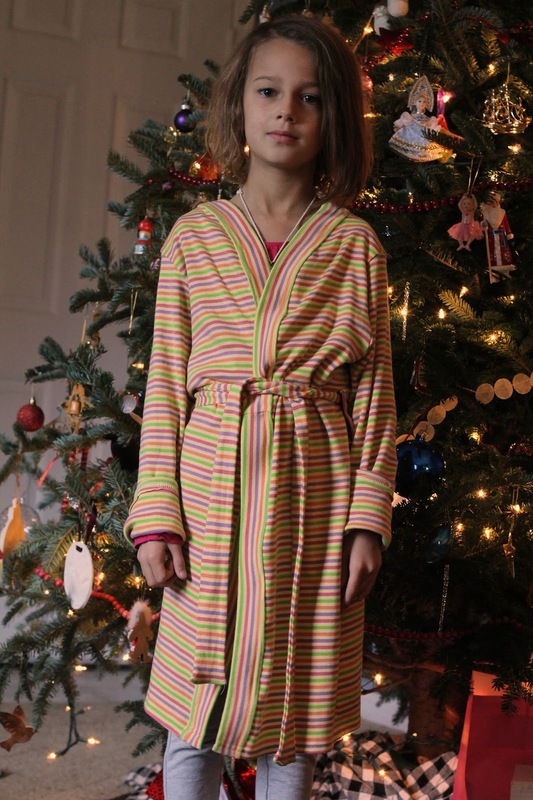 I sewed this pair using a scrap of novelty cotton left over from a beloved dress I made for Z when she was 3. I bought some faux sherpa at Joann's for the interior. The pattern calls for a ton of interfacing, but I skipped it and I don't think anything is lacking for it. The pattern leaves raw edges on the inside where the sole is sewn to the uppers. Then you sew a separate sole pad, incorporating some batting, to insert into the shoe. I'd rather have the slipper all be one piece, but my attempt on the second pair to do so didn't work too well, so I went back to the pattern instructions. I bought some non-skid utility fabric to use for the soles. And I finished them with some labels that a friend bought me last year. The second pair has a mink interior, so it's not as plush as the first pair. The minky feels awesome on the feet though. *In other news, Blogger is doing this weird thing where it wants to center all my text, and I can't seem to un-center it. Really annoying! My little brothers, like most guys I know, are crazy hard to shop for. This year, the gift budget being a little smaller than in years past, I decided to experiment and make some gifts for them. So I went to Joann's in search of sports team fabric. 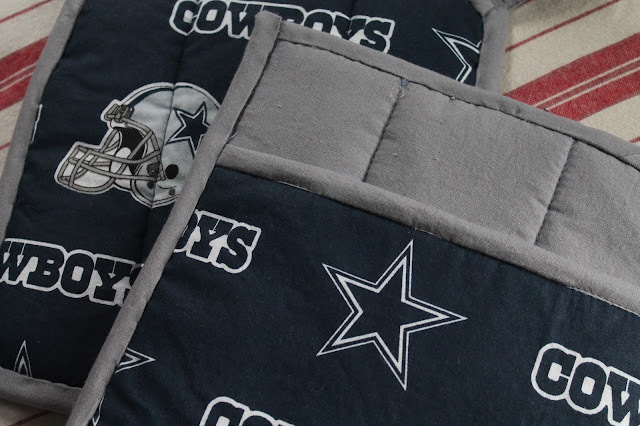 I found their favorite football teams' logos printed on cotton, but I had to steel myself to buy the fabric. Ugh. It is without a doubt the worst quality cotton I have ever felt. I love Parks and Rec. Anyway, the fabric is super-stiff, even after washing, and printed totally off-grain. It actually made me kind of mad how much they charge for it. Thankfully I did not need much, and it was on sale. My 26-year-old bro, who has the wherewithal to buy himself whatever he wants, likes to cook and recently got all excited about a deal on a set of Rubbermaid food containers from Amazon. I made him a pair of Dallas Cowboys potholders. I have to admit, I'd never really considered potholders a reasonable gift until a very thoughtful friend gave me a set from Sur La Table for my birthday. Besides matching my kitchen curtains and being completely adorable, they are the cushiest, least-burn-y potholder I've ever owned. And I've owned a lot of crappy potholders. 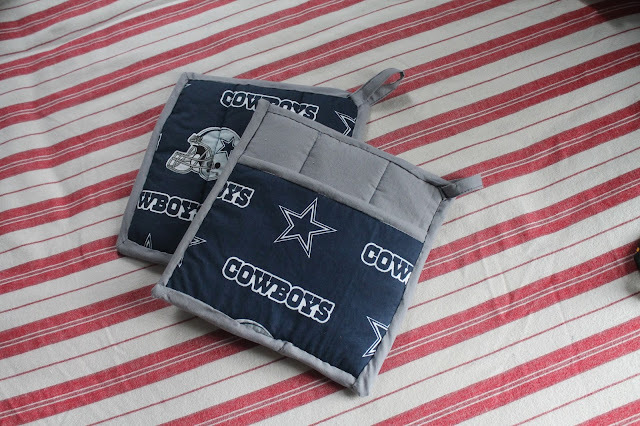 So I decided to model my Cowboys potholders on those. 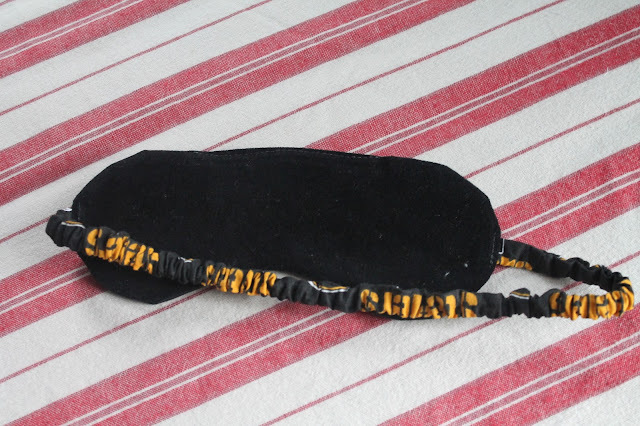 After doing a fair amount of research on the Internet on the best way to make potholders heat-resistant, I still distinctly had no idea what to do. So I picked up some Insul-Brite and batting at Joann's. I pinned the fabrics together and used them to grab on to my hot iron to test their heat resistance. One layer of Insul-Brite was not enough, so I used two for the main potholder (the part that will touch the hot pans) and two layers of batting for the pocket (though I could easily have used just one. I quilted the two layers and hand-finished the binding (only because with all the bulk, it would have been really hard to stitch evenly through all the layers). Also I accidentally did not put the hanging loops on the same corners of both potholders. I doubt he will notice that, though. My youngest brother, who is 23 and about to get engaged, is getting a gag gift along with a meat injector (he also likes to cook). 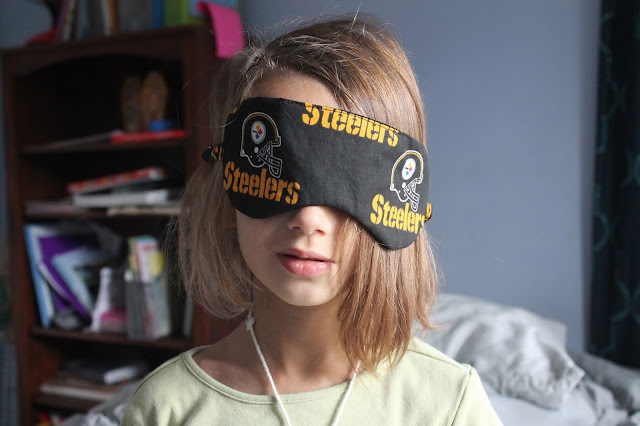 We all poke lighthearted fun of the fact that he likes to sleep with an eye mask. It's nothing froofy, just something that he got on a flight way back when airlines actually gave you stuff to make your flight comfortable (anyone remember those days?). I knew he would not appreciate potholders, nor really anything I could make him, so I decided to go funny. 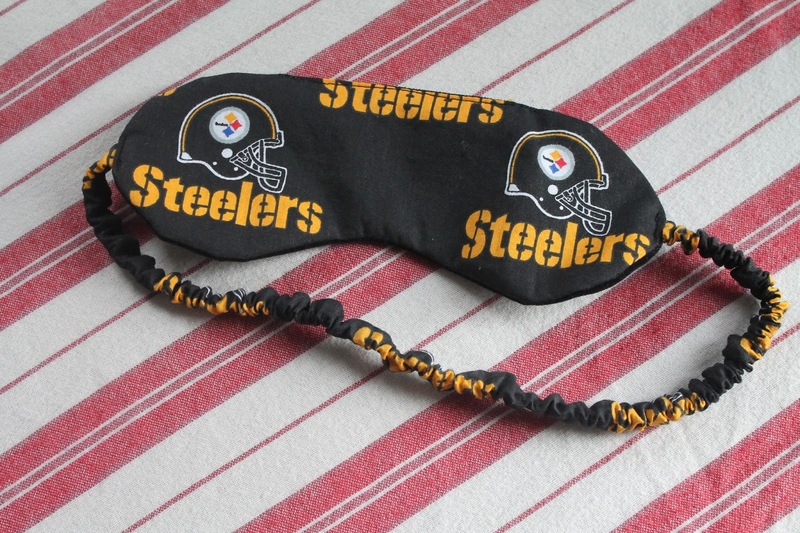 I used his favorite Steelers fabric and a scrap of cotton velveteen to make an eye mask (free pattern). I left out the batting because I don't think it's necessary. I also shortened the fabric part of the strap because it was way too long, especially in this horrid stiff cotton. I can't wait to give it to him. It is going to be hilarious. We're headed to visit the inlaws over New Years, and it will be the first time that all six grandchildren (three of whom were born since last December) will be in the same place. To celebrate, we will be doing family photos. The colors are navy, gray and mustard. I wholeheartedly supported my sister-in-law's suggestion of this color scheme because my family happens to have a lot of gray and navy clothing. 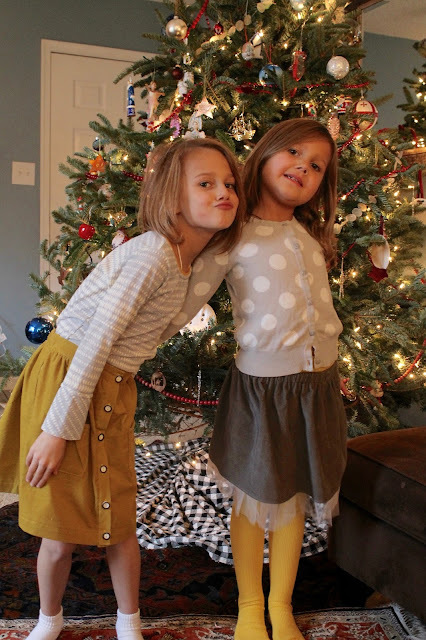 But when I surveyed my girls' closets, I realized that I wasn't in love with most of their existing options. Oliver+S to the rescue! First up was a quick Lazy Days skirt using gray cord that has been in my stash forever (I used most of it to make tiered Lazy Days skirts about two years ago). I added an improvised pleated tulle detail to the hem for festive-ness. I really love the way it turned out! Miss Z will wear it with a RTW dotted cardigan I bought her a couple years ago, a pair of yellow Hanna Andersson tights snagged off eBay, and her black patent clogs (not pictured). 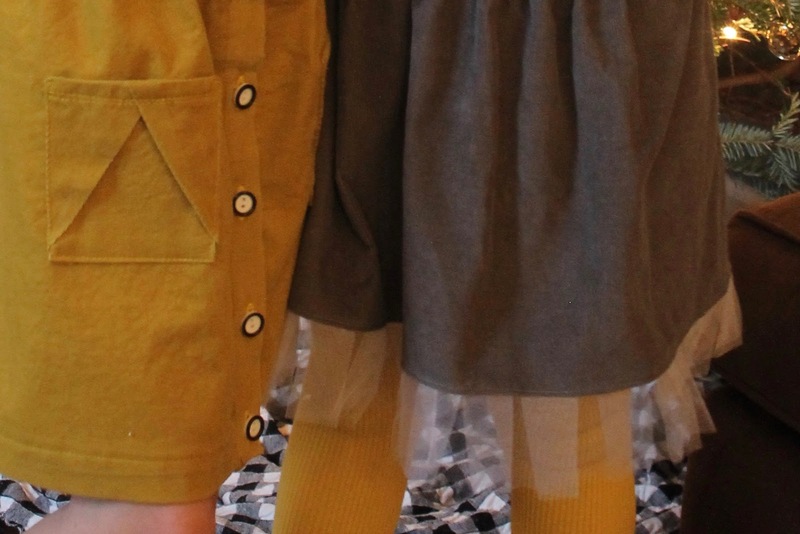 I knew I wanted to make a mustard-colored skirt for N, but I couldn't find the right color locally. I located some mustard corduroy at Miss Matatabi, ordered it, and held my breath that it would arrive before our trip. I was so surprised when my order showed up less than two weeks later! I decided to make a Hopscotch skirt. I sewed a size 4 with 2" extra length. There is quite a bit of excess fabric in the back - so much that it juts out strangely. I probably should have cut some of the width off. I used some thrifted black and white buttons and love the 70s vibe. 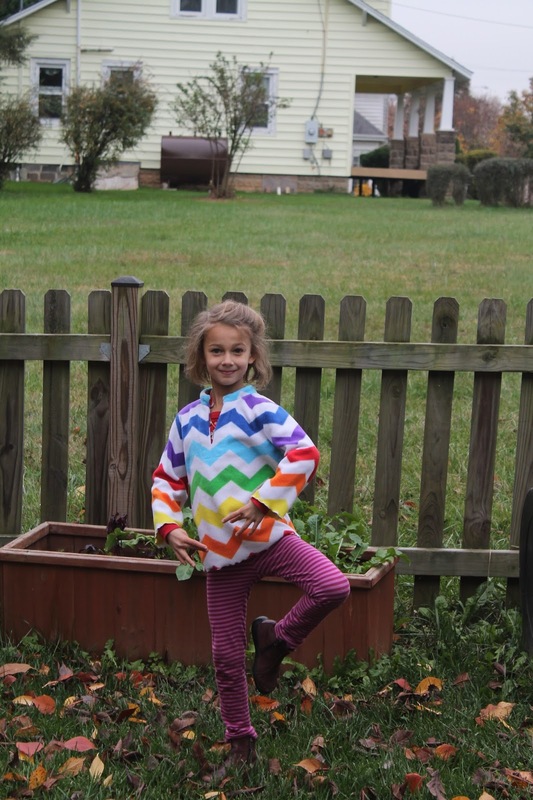 Her shirt is an O+S Schoolbus tee, with pieced sleeves due to lack of fabric. Since I was piecing the sleeves already, I decided to cut the bottom sleeves pieces on the bias into a bell shape. 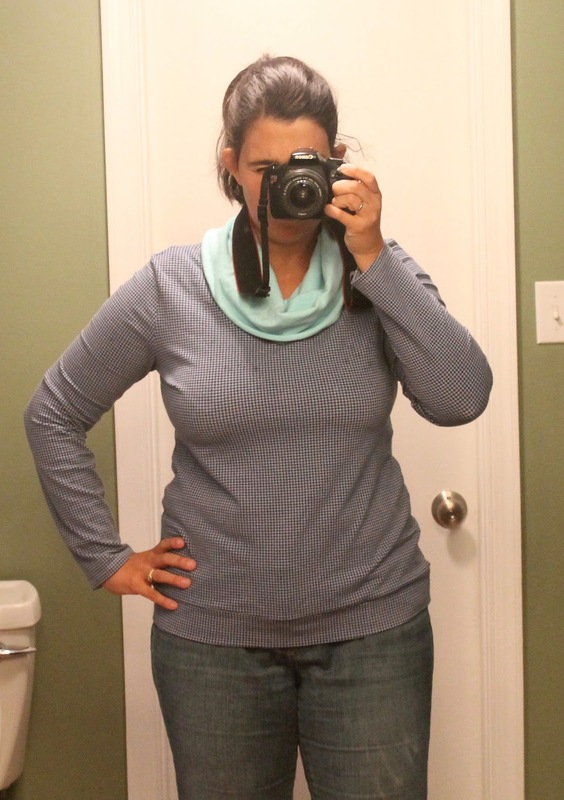 I left the sleeve hems unfinished, but hemmed the bottom of the shirt. I topstitched the seam allowances down for all the horizontal sleeve seams. I also scooped out the neckline a bit. The jersey I used (Hancock Fabrics) wasn't stretchy enough to bind the neckline, so I used a scrap of Art Gallery knit in Sahara Sun instead. Miss N will wear her outfit with either gray or navy tights (I am undecided) and her russet brown ankle boots. I plan to make hair bows for my nieces out of the leftover cord. I did not have to make anything new for the boys' outfits. They both have gray Art Museum corduroys made by our fairy godmother. Gabriel will wear his with a navy and white checked button-down and a navy sweater vest. I'm not positive what Niko will wear, but he has ample options in all the necessary colors. My husband is set too ... just me left now. I have some navy and white striped knit in the stash that might become a Plantain to wear either with jeans or a gray skirt I recently found at the thrift store. We'll see. I recently decided that enough was enough, and dusted off my long-neglected copy of Ripped in 30. I've been faithfully doing the workout four times a week for the last three weeks (she recommends five to six times a week, but I have trouble enough fitting four workouts in!). 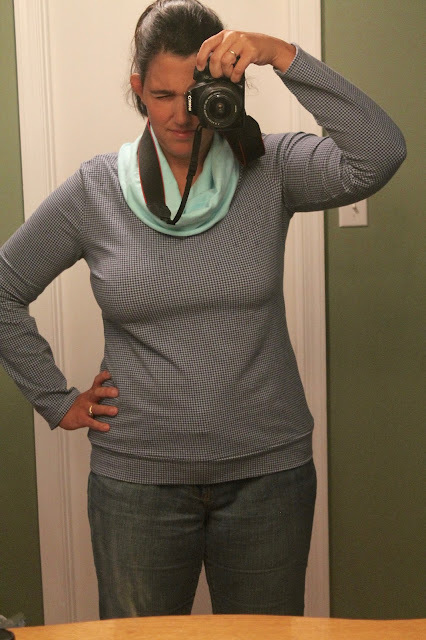 I am still sewing, but my project photography and blogging time has suffered as a result. I did finally manage to get a few snaps of the trio of Cozy Winter Hoods (from Little Things to Sew) I have been working on these past two weeks. 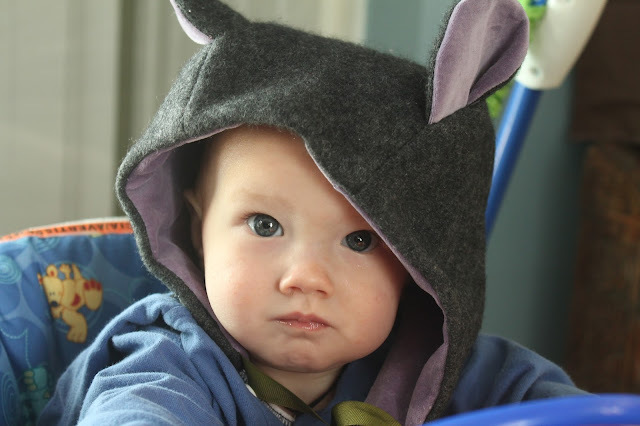 The first hood, a gift for a baby who lives in cold climes, is sewn from cashmere with a tragic past: When I was in the States waiting for Gabriel to be born, my husband took almost all his sweaters to the dry cleaners (in Georgia). Every single sweater came back felted. Thankfully, he had not sent any of my hand knits, but there were two cashmere sweaters in the lot! I kept those with the intention of making baby stuff some time, but this is the first time I had cut into one of them. I lined it with stashed velveteen. 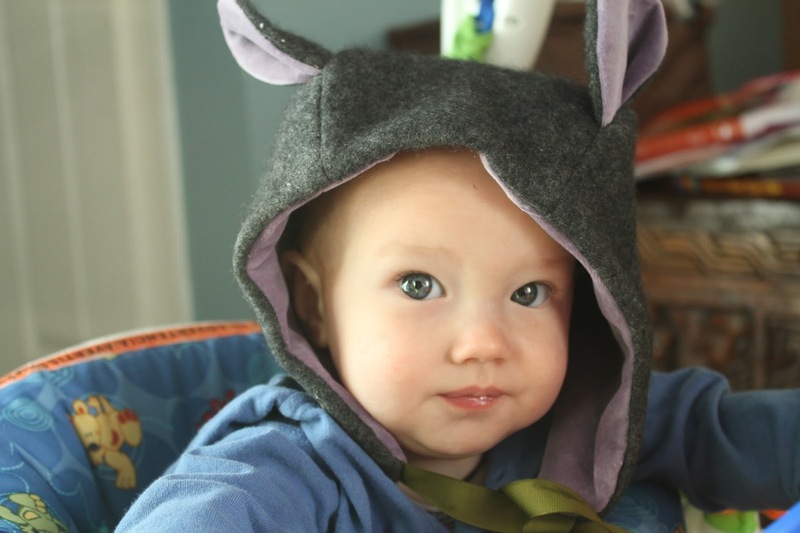 I sewed the smallest size - 6-12 months, but as you can see it is quite roomy on my six-month-old model. So when I made the second hood, I sewed the seams joining the center hood and side hood pieces with a 3/4" allowance to make it smaller. I kept the 1/2" allowances around the perimeter of the hat though. This one, which is for Niko, fit him perfectly. 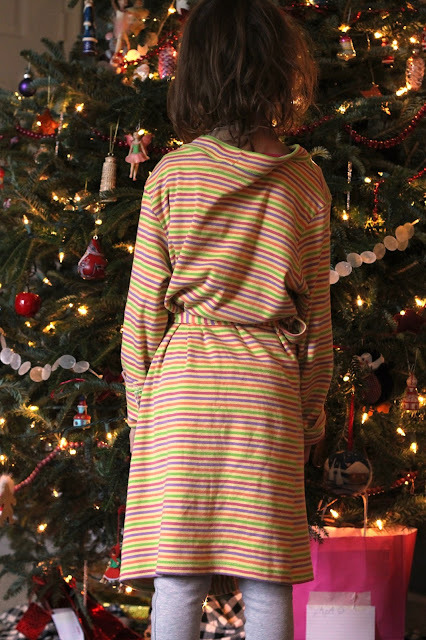 The fabrics are fleece I bought two years ago with the intention of making the same pattern for Gabriel. Yeah, that didn't happen. But I'm glad I managed to make it for Niko, because it is just as cute as I had imagined it would be! I swapped out the ribbon ties for a tab snap closure on this one. I guessed on the placement of the snap tab, though, and it doesn't quite go under his chin the way it's supposed to. 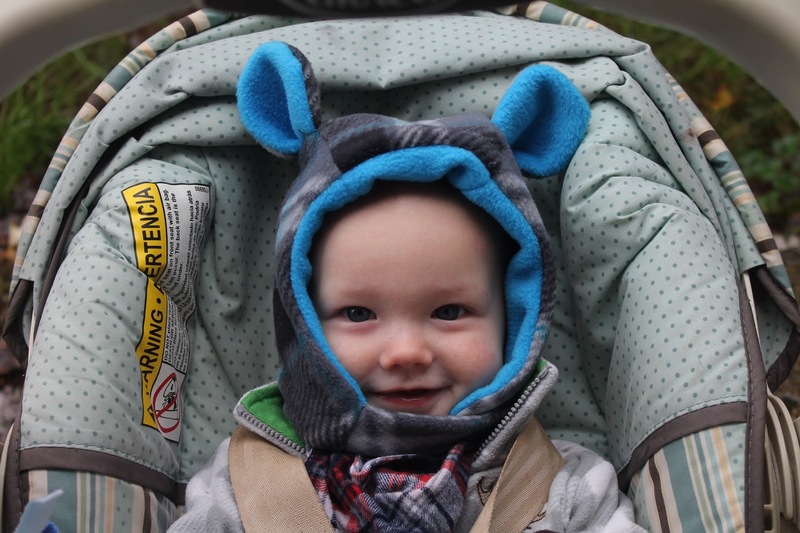 My third hood is for a one-year-old who lives in a warm climate where it sometimes gets a little chilly. 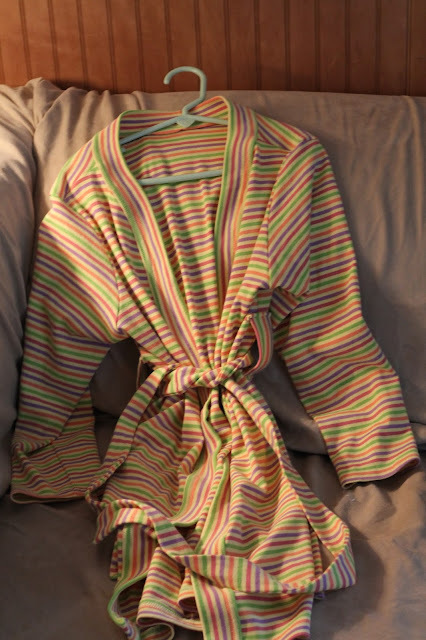 I used one layer of fleece and one layer of cotton knit for this one. 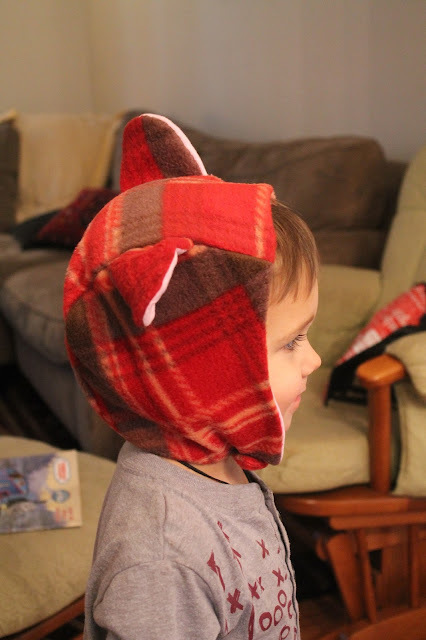 I did the snap tab again put sewed it further back on the ear flaps to get it to sit nicely under the chin. I should have traced the next size up, but I was in a rush to get it done, so I just used the extra small size again and sewed it with a 1/4" allowance. It's a bit tight on G, but should fit the intended recipient perfectly. A very quick and fun sew that I will not hesitate to pull out again for baby gifts! I think I will keep the snap-tab mod, though, as I find that ties on babies come undone too often.